The daughter of actress Lilian Braithwaite , Joyce Carey was born in London on 30 March 1898, was on stage from 1918 and stayed there for nearly 70 years, at 86 playing Peter O'Toole 's mother in Pygmalion(1984). She made three silent films, but her screen career really began when she played Bernard Miles 's wife in In Which We Serve (1942), by Noël Coward , in whose plays she often starred. Her imposing screen persona comprehended the pseudo-refined barmaid in Brief Encounter (d. David Lean, 1945), acidulous spinsters ( The Way to the Stars , d. Anthony Asquith, 1945; The Chiltern Hundreds , d. John Paddy Carstairs, 1949; Libel , d. Asquith, 1959), loving wives ( Cry, the Beloved Country , d. Zoltan Korda, 1952), and warm-hearted upper-class aunts ( A Nice Girl Like Me , d. Desmond Davis, 1969). 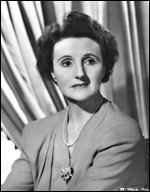 She wrote two plays as Jay Mallory, and received the OBE in 1982.